My printer was contemplating arson. but a quick solder and sorted! This really should be looked at from Anet. Another 10 - 15 minutes and it could have caught fire and remember this printers frame is made out of Perspex! A metric FU*K tone of Perspex! All the fuel a fire would ever need! 25W heaters maybe the way to go. So what if it take 20 minutes to heat up. 20 minutes is a small fraction of the time some prints take to complete and the fact is it's less likely to burn your house / garage down is a bonus! Yes its all to do with the max temp it can reach if left on constant like if there was a fault, A 40w heater that's left on constant it can reach some thing like 600 degrees and melt aluminium the 25w version is quite a lot less and a fair bit safer, I'm not sure of the exact details but it makes a lot of sense. I never use solid plate heatbeds now, both my printers are converted to use silicone pads. They come pre-wired with the connections (power and thermistor)imbedded into the silicone coating which means zero chance of stressing the pad connection and pulling the wires off, on top of that the heat up time is super fast (takes about 8-10mins to hit 130c) yet it seems to demand less load from the PSU as my previous mk3 ALU did. thats the last one I bought for the PolturXL which is actually running a 300x200 print bed, but I found that even with the undersized pad underneath the overhanging print bed surfaces were only showing a 4-5c difference. 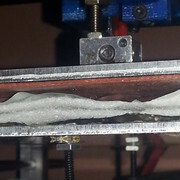 Ive ran 280x180 sized ABS prints on it a not suffered warping on the overhang edges. the white stuff you can see beneath is just heatproof insulation to reduce downwards heat loss..... not that the silcone pad really needs it tbf. I find the best ones come from Keenovo https://www.keenovo.com They are really very good tho not the cheapest. They make them all to order and will do one to your own specifications even down to whether you want Thermistor/Thermocouple they will even put a PT100 sensor in it if you wish you also get a choice as to where the sensor goes (Bottom of the pad or on the Heatsink side They will do them in whatever voltage you want and power density the recommended Power density for heated is 0.4-0.5 W/cmˆ2. I was pointed in a similar direction when I mentioned changing over in a thingiverse group (cant recall if it was keenovo or somewhere else though) but I decided to give the cheapo banggoods a go before hand to see if it was worth the effort atall.